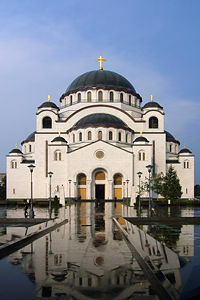 The (Orthodox) Temple of Saint Sava (Serbian: Храм Светог Саве) in Belgrade, Serbia is the largest Orthodox Church currently in use. The church is dedicated to St. Sava, founder of the Serbian church and an important figure in medieval Serbia. The temple has been built on the Vračar plateau, on the location where, in 1595, St. Sava’s remains are thought to have been burned by Turkish Sinan Pasha. From its location, the temple dominates Belgrade's skyline and is perhaps the most monumental building in the city. The building of the church structure has been financed exclusively by donations. The parish home is nearby, as will be the planned patriarchal building. The construction of the temple completes Belgrade's skyline: Kalemegdan - Trg republike - Terazij - Beograđanka - Slavija - Temple of St. Sava. The temple’s main dome rises to a height of 134 metres (439.6 ft), from a level of 64 metres 210 ft above the Sava river. The church, thus, holds a dominant position in skyline of Belgrade and is visible from all approaches to the city. The church building is 91 m (298.5 ft) long from east to west, and 81 m (265.7 ft) wide from north to south. The temple is 70 m (229.65 ft) high, and the dome is topped by the main gold-plated cross raising another 12 metres (39.4 ft). The lesser domes are topped by 18 more gold-plated crosses of various sizes, while the bell towers hold 49 bells. The surface area of the ground floor is 3,500 square metres with three galleries: one of 1,500 square metres in area on the first level, a 120 square metre gallery on the second level, and a choir gallery that holds 800 singers. The temple can hold 10,000 faithful at any one time. The basement contains a crypt, the treasury of St. Sava, and the grave church of St. Hieromartyr Lazar, with a total surface area of 1.800 square metres. The façade of the temple is done in white marble and granite. The inner decoration is being done as mosaics. The central dome will contain a mosaic of Christ Pantocrator. To give a sense of the monumental scale of this mosaic, each eye will be about 3 metres wide. Construction of the temple had been slow, delayed by events in Serbia over the last century. Three hundred years after the burning of St. Sava's remains, a Society for the Construction of the Temple of St. Sava on Vračar in Belgrade was founded in 1895. The goal of the project was the construction of a temple on the place of his death. Initially, a small church was built on the site of the future temple. This church was later moved so the construction of the temple could begin. In 1905, a public contest was launched for a design of the planned temple. However, all five of the initial proposals received were rejected as not being acceptable. Soon after the first attempt for a design of the proposed temple had been made, the breakout of the First Balkan War in 1912, and subsequent Second Balkan War and First World War, stopped all activities leading to the construction of the temple. In 1919, after the war, the Society was re-established. New calls for designs were made in 1926. This time, twenty-two proposals were received. Although first and third prizes were not awarded, the second-place design, by architect Aleksandar Deroko, was chosen for the construction of the temple. Thus, forty years after the initial idea was aired, building of the temple began in May 10, 1935. This was 340 years after the burning of St. Sava's remains. The cornerstone was laid by Bishop Gavrilo Dozic-Medenica (the future Serbian Patriarch Gavrilo V). The project was designed by Aleksandar Deroko and Bogdan Nestorovic, aided by civil engineer Vojislav Zadjina. Construction continued until the start of Second World War and the occupation of Yugoslavia in 1941 by the Axis powers. The temple's foundation had been completed and walls erected to the height of seven and eleven metres. After the bombing of Belgrade in 1941, all work ceased. The occupying German army used the unfinished temple as a parking lot, until in 1944, when the partisans and the Red Army took over and used it with the same purpose. Later, the site was used for storage by various companies. The Society for Building of the Temple ceased to exist and was not revived. In 1958, Patriarch Germanius renewed the idea of completing the construction of the temple. After 88 requests were made for continuation of the building of the temple—and as many refusals, permission for finishing the building was granted in 1984. Branko Pešić was, then, chosen as new architect of the temple. He reworked the original project designs to make better use of new materials and building techniques. Construction of the temple began again on August 12, 1985 as the walls were completed to their full height of 40 metres. The greatest achievement of the building was lifting in place of the 4,000 ton central dome. The dome was built on the ground, together with the copper plate and the cross. Later, it was lifted onto the walls. The placement of the dome took forty days and was finished on June 26, 1989. By 2004, the main structure of the temple was generally completed. The bells and windows had been installed, as well as had the facade been completed. Work on the inner decoration of the temple has continued. This page was last edited on October 21, 2012, at 21:09. This page has been accessed 21,732 times.